Yet self-criticism of our own governments is almost impossible. Infinitely more effective than state censorship – which can restrict criticism – is self-censorship, and that’s pretty much what we have: a society which is incapable of seriously challenging those in power, let alone calling them to account for any wrongdoing – not through any state-imposed censorship, but through creating a culture that’s utterly brainwashed into believing the perfection of their constitution and therefore refusing to even imagine its very considerable imperfections. Whilst we do not have the domestic death squads and concentration camps of Hitler’s Germany or Stalin’s Russia to enforce domestic obedience, we still have loyal populations that are almost as effectively programmed to believe the perfections of their state leaders and their institutions as many Germans and Russians were during the Hitler and Stalin years. I can’t see that the Queen is ever going to be really poor, but I’m sure we can find a council house for her — we’re going to build lots more. Similar sensationalist headlines led in almost every newspaper and TV news broadcast. Green Party membership, which had been surging until that moment, immediately fell off a cliff. I was a membership secretary for our local Green Party branch at the time and had been signing up new members at the rate of about two a week. New memberships not only stopped completely, but some who had just joined us immediately cancelled their memberships. And this from people who would see themselves as progressives. No need to guess how Tory voters, who comprise most voters, reacted to Bennett’s quip. Such is the level of brainwashing in a supposedly democratic country about the perfection of the British monarchy, and its unchallengeable position as unelected head of state. But it’s not just Britain that has to endure a majority of brainwashed citizens. I remember seeing a TV documentary about the time of the illegal Iraq War in 2003. The programme was about heroic US marines bravely defending western freedom, by helping to kill defenseless Iraqi civilians. Some of the heroes were interviewed about the hard time they were having, and the one that will forever stick in my mind implied that no amount of personal suffering was too great for him. “I would slit my own throat for my president”, he said. So Iraqi civilians didn’t have much chance. When, very occasionally, some of the major crimes of our great trusted leaders are brought to our attention, there is never any clamouring for justice, no national outrage that the public’s trust could be so cheaply squandered. Whilst some newspapers might print a subdued story or two, located somewhere towards the bottom of page thirty nine, and whilst national TV stations may record a few words tucked away deeply buried somewhere on their websites, in the sacred name of “balance”, the real gravity of the misdeeds of our trusted leaders are otherwise routinely ignored, and the revelations are quickly lost in the usual myriad of trivial distractions. For example, when, after many years and thirteen million pounds of treasure, the Chilcot Report was eventually published, effectively providing sufficient evidence for Tony Blair and other establishment leaders to be indicted for war crimes, no such calls from our trusted leaders were heard – just a deafening silence, followed almost immediately by business as usual. But those who dare to provide the evidence of our rulers’ misdeeds are quickly and viciously victimized – as any whistleblower could easily confirm; with the better-known of whom, such as Daniel Ellsberg, Mordechai Vanunu, Julian Assange, Chelsea Manning and Ed Snowden standing as fine examples of the terrible consequences of speaking the truth about power. This is how Rosa Luxemburg’s ruthless self-criticism is rendered impossible in our “free” societies where official censorship doesn’t exist, but where official “news” isn’t worth censoring. One of the holiest cows of the establishment, the institution which, almost above any other, will not tolerate any form of criticism, are our so-called “defence” forces. The word “hero” has been re-defined to mean absolutely anyone wearing a military uniform. TV commercials encouraging young people to join the armed forces appear almost every night. TV programmes depicting the military as brave heroes resisting overwhelming odds in the sacred name of freedom and democracy appear almost every night. Every year people adorn themselves in little plastic poppies and stand in silence for two minutes on the 11th November, not so much to recall those who were needlessly slaughtered for the supposed “war to end all war”, but to serve as a subliminal recruitment aid. Criticising the armed forces is always strictly off limits. 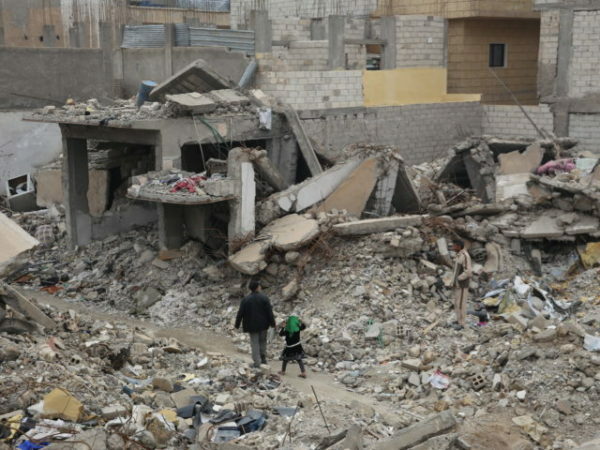 Yet a recent report by Amnesty International (AI), who investigated the devastating attack by western coalition forces on the Syrian city of Raqqa, is so damning that anyone who does not criticise those responsible is guilty by association of war crimes.4 They are in a similar position to those who silently stood by as their neighbours were carted-off to Nazi concentration camps. Although AI has a somewhat dubious reputation, earned mainly by its very tepid response to the multitude of horrors perpetrated over many years by the Zionist regime in Occupied Palestine, its latest report on Raqqa has some merit. 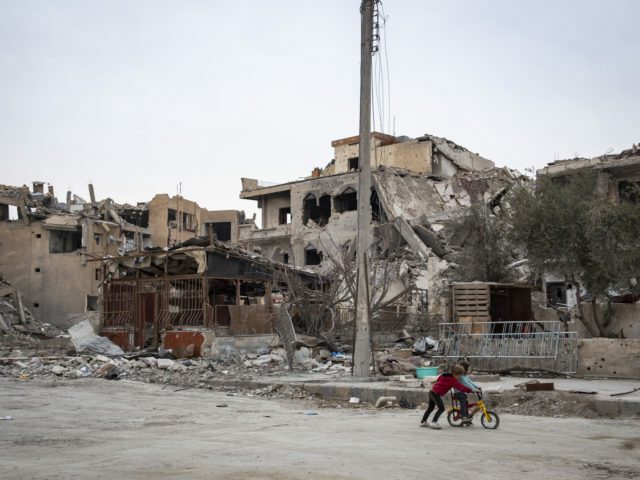 The four-month military operation to oust the armed group calling itself Islamic State (IS) from Raqqa, the Syrian city which IS had declared its capital, killed hundreds of civilians, injured many more and destroyed much of the city. 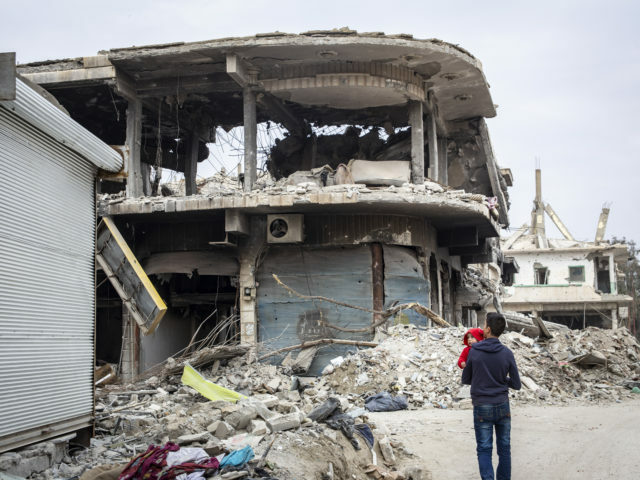 During the course of the operation, from June to October 2017, homes, private and public buildings and infrastructure were reduced to rubble or damaged beyond repair. If Amnesty was referring to North Korea, say, or Iran, Russia, China, or the Syrian government, almost certainly its report would have been leading the western world’s news broadcasts. Outraged politicians and their tame propagandists in the mainstream media would have been demanding that “something should be done”. But those countries were not the subjects of the Amnesty report. It was referring instead to the biggest villains in the world — the US and British governments, joined on this occasion by France. Although other countries were implicated in this particular “coalition of the willing”, their roles were relatively minor. Consequently our politicians and their lackeys in the mainstream media seem hardly to have noticed AI’s report. Once again the truth is available, but has been conveniently self-censored by all the usual tricks of state. Two investigators from AI spent two weeks in February 2018 visiting the ruins of Raqqa. They went to 42 different locations and interviewed 112 civilian residents. About half of the report focuses mainly on the personal stories of four families whose lives were devastated by the “liberation” of Raqqa from IS occupation by the combined efforts of western firepower, and ground-troops supplied by the Syrian Democratic Forces (SDF) – a mainly Kurdish militia. [T]he US deployed some 2,000 of its own troops to north-eastern Syria, many of whom were engaged in direct combat operations, notably firing artillery into Raqqa from positions outside the city. In addition, a smaller number of special forces were operating close to front lines alongside SDF members. British and French special forces were also deployed to the area, but in much smaller numbers. While Coalition forces operated mostly from positions several kilometres outside the city, a small number of special operation forces from Coalition member states – notably the US, UK and France – operated alongside the SDF close to front line position in/around the city, reportedly mostly in an advisory rather than combat role. Although Kurdish militia were reportedly too lightly-armed to be physically accountable for the destruction of Raqqa, their target identification function was clearly significant. 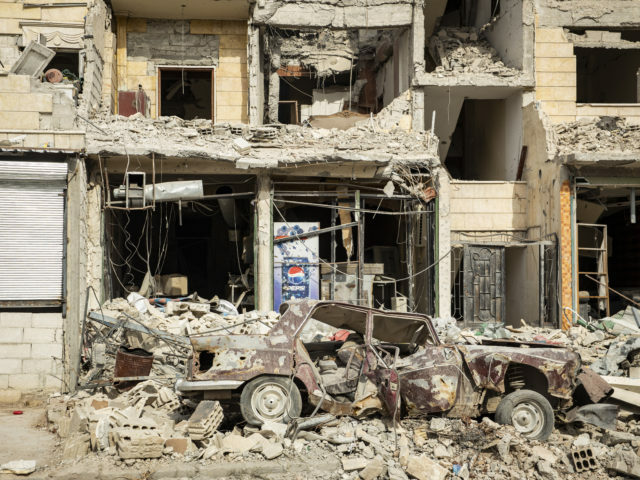 It has long been routine for the military’s propaganda machine to dismiss concerns about civilian casualties inside war zones, and the carnage wreaked on Raqqa was no exception. Furthermore, the military’s word is always accepted at face value. But the alleged accuracy of the ordnance used by the military is not the point. The point is that no matter how smart the smart bombs are, they’re still killing civilians – and that’s a war crime. An estimated 4,000 bombs were dropped on the defenceless civilians of Raqqa by “coalition” warplanes. Given that many of those are only accurate, on a good day, to within ten metres of their target, it’s very clear to see that these alone must have accounted for considerable civilian casualties. But they may not have been the main problem. But legitimate ISIS targets must have been almost negligible, as IS had immersed themselves amongst the civilian population. Given also that most artillery shells are considerably less accurate than guided missiles, and can only be expected to strike within a hundred metres of their targets, and given that tens of thousands of these things rained down on the trapped and defenceless civilians of Raqqa, the claims by the military’s propagandists that they tried everything possible to minimise civilian casualties are obviously ludicrous. enabled many hundreds of IS fighters to escape from the city. At the time, neither the US and British-led coalition, nor the SDF, which it backs, wanted to admit their part. Has the pact, which stood as Raqqa’s dirty secret, unleashed a threat to the outside world – one that has enabled militants to spread far and wide across Syria and beyond? Freed from Raqqa, where they were surrounded, some of the [IS] group’s most-wanted members have now spread far and wide across Syria and beyond. So, clearly essential water supplies were either deliberately targeted by the “coalition”, or some “legitimate” target was so near that the likely presence of defenceless civilians was simply ignored. 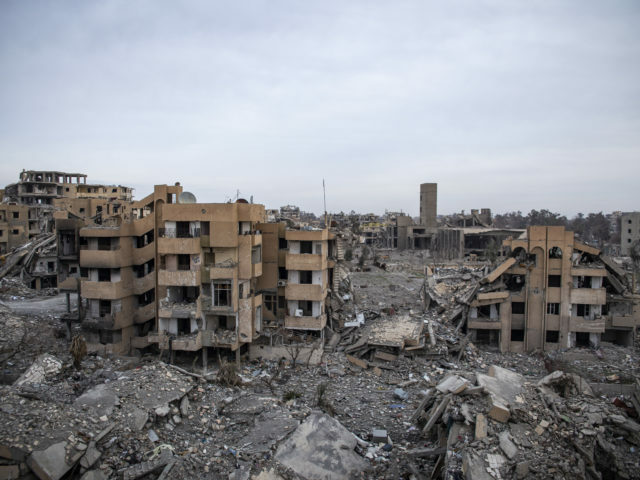 Whilst it is undeniable that the head-chopping organ-eating occupiers of Raqqa were about as vile a group of psychopaths as it’s possible to get, and that their removal from Raqqa would no doubt be extremely difficult to accomplish, it’s deeply questionable that the total destruction of a civilian-occupied city could be considered proportional to the reign of terror it was supposed to terminate. 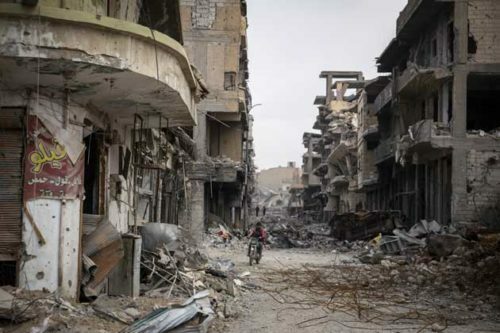 The fact that IS were eventually cleared out of Raqqa, very much alive and well, shows that they were not committed kamikaze warriors and suggests that alternative methods for bringing to an end their repulsive occupation may have been possible. In order for parties to an armed conflict to respect the principles of distinction and proportionality they must take precautions in attack. “Constant care must be taken to spare the civilian population, civilians and civilian objects”; “all feasible precautions” must be taken to avoid and minimise incidental loss of civilian life, injury to civilians and damage to civilian objects. The parties must choose means and methods of warfare with a view to avoiding or at least minimising to the maximum extent possible incidental loss of civilian life, injury to civilians and damage to civilian objects. As well as verifying the military nature of targets and assessing the proportionality of attacks, the parties must also take all feasible steps to call off attacks which appear wrongly directed or disproportionate. Parties must give effective advance warning of attacks which may affect the civilian population, unless circumstances do not permit. When a choice is possible between several military objectives for obtaining a similar military advantage, the parties must select the target the attack on which would be expected to pose the least danger to civilians and to civilian objects. Amnesty claim that up to the point of publication of their report repeated approaches to “the coalition” for specific details regarding their attacks on Raqqa were either inadequately answered or had not been answered at all. Therefore questions relating to whether sufficient precautions were taken remain unanswered, and could imply breaches of international law. Requires all states to ‘respect and ensure respect’ for its provisions under Common Article 1 of the Geneva Conventions. This includes both positive and negative obligations on states providing assistance to another state which is then used to commit a violation of international humanitarian law. The negative obligation is not to encourage, aid or assist in violations of IHL by parties to a conflict. The positive obligation includes the prevention of violations where there is a foreseeable risk they will be committed and prevention of further violations where they have already occurred. I’m going to tell you something,” Dumas said on French station LCP. “I was in England two years before the violence in Syria on other business [in 2009]. I met with top British officials, who confessed to me that they were preparing something in Syria. This was in Britain not in America. Britain was organizing an invasion of rebels into Syria. They even asked me, although I was no longer minister for foreign affairs, if I would like to participate. Naturally, I refused, I said I’m French, that doesn’t interest me. So Dumas may have said – but the French were involved in the destruction of Raqqa. If similar probable war crimes had been carried out in some other country by Russia, say, or China, or Iran, or any other nation to which the west is routinely hostile, almost certainly outraged voices would be heard caterwauling in Westminster and Washington. Front pages of newspapers, together with TV and radio news programmes would be howling that “something must be done”. Yet in Westminster and Washington the silence is deafening. Not a single word of protest appears on the front pages of our newspapers, and our TV and radio stations appear to be looking the other way. Why? Because our “heroes” are personally involved, and personally responsible for the terror, and that is the terrible truth that cannot be admitted. The cold hard fact is that far from being heroic, many people in the military are de facto war criminals. From at least as far back as the second world war, when defenceless civilians were bombed to death and incinerated in their homes in the pointless bombing of Hamburg, Dresden and Tokyo, for example, Hiroshima and Nagasaki, through the slaughter of countless defenceless civilians in later wars, in Korea, Vietnam, Cambodia and Laos to the more recent civilian killing fields of Iraq, Libya and now Syria, our so-called heroes have just as much innocents’ blood on their hands as any Nazi war criminal ever had. We need complete, truthful information. And the truth should not depend on whom it is to serve. Self-criticism – ruthless, harsh self-criticism, which gets down to the root of things – that is the life-giving light and air of the proletarian movement. I have an idea, Father, a half-formed idea,that before we can go on to a sane new order, there has to be a far more extensive clearing up of old institutions… The world needs some sort of scavenging, a burning up of the old infected clothes, before it can get on to a new phase. At present it is enormously encumbered… This is just a shadowy idea in my mind… Something like breaking down condemned, old houses. We can’t begin to get things in order until there has been this scavenging. — HG Wells, The Holy Terror, Simon and Schuster, 1939. This article was posted on Thursday, June 21st, 2018 at 1:20pm and is filed under "The West", Crimes against Humanity, Disinformation, Empire, France, Human Rights, ISIS, Massacres, Media, Media Bias, Mercenaries, Militarism, Narrative, President Bashar al-Assad, Propaganda, Proxy Armies, Refugees, Russia, Syria, Terrorism (state and retail), United Kingdom, United States, US Hypocrisy, US Lies, US Terrorism, War Crimes, Weaponry.